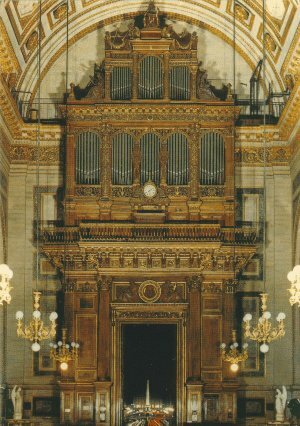 Sample set of the Cavaillé-Coll organ of the Madeleine church in Paris. This sample set features five sound combinations of this famous organ. Please make use of the free trial version of this sample set before purchasing it. Please click on the Trial Version-Tab for more information. You will also need to have the trial version installed as a prerequisite for installing the full version. This sample set is available as download only. The download link will be mailed to you after your payment is received. This superb organ is now available as a sample set for the Hauptwerk-2 virtual pipe organ software. All samples have been recorded in 16bit stereo at 44100Hz wave-format. Careful noise reduction has been applied to preserve the original as faithfully as possible. The samples have been recorded by Peter Ewers during a recording session for a CD with improvisations on the organ. All samples have been recorded with full room ambience. There are four samples/octave. As a first for any Hauptwerk sample set we have created staccato relese sample artificially using an impulse response carefully designed to match the original room accoustics as closely as possible. We think the result is improved dramatically over the standard release tails, which lead to bell-like artefacts on staccato notes. Compatible with Hauptwerk Free Edition. This sample set is compatible with Hauptwerk version 3.20 and above. It will work on the Hauptwer Free Edition as well as with Hauptwerk running in Evaluation Mode. This set requires only very little ressources. In Hauptwerk memory requirement is as little as 660MB loading all samples compressed and about 1100MB uncompressed. A polyphony of about 500 voices should be sufficient. §1) This agreement defines the licensing agreement between Pipeloops (Reiner Suikat) and the customer for our sample sets. The sample set consists of the samples and, depending on the version, images, database and other files. §2) Pipeloops grants the customer the perpetual right to use the sample set with any software capable of playing the samples. Pipeloops retains all rights, including all copyright and intellectual property rights, to the sample set and all copies thereof. §3) The customer may use the sample set for public performances and/or recordings without any restrictions unless specific restrictions are mentioned for a sample set. The customer must credit the use of the sample set in the program notes and notify Pipeloops of the performance / recording via e-mail. §4) The customer is allowed to make backup copies of the distribution media as needed. However, the customer must not distribute copies of the sample set or parts of thereof to third parties. On this page you find recordings made with the Madeleine sample set using the Hauptwerk™ virtual pipe organ software. All demos have been recorded directly without any further processing. A fantastic improvisation by internationally acclaimed concert organist/composer Hans-Dieter Karras showcasing the glorious Tutti of the Madeleine set. Directly recorded using Hauptwerk’s recording feature without any further processing. Enjoy! The set of demos listed below has been recorded using some short improvisations recorded as MIDI-files by Peter Ewers. No effect processing has been applied to the recordings. The Virtual Cavaillé-Coll Madeleine sample set (Hauptwerk version only!) is being made available as a trial version for download. After loading the sample set into Hauptwerk (min. Version 2) it will work for 75 seconds. After this time no sound will be produced and you will have to reload the sample set to continue your evaluation. Please read the license agreement below before downloading the sample set. By clicking on the download link below you automatically agree to the license conditions. 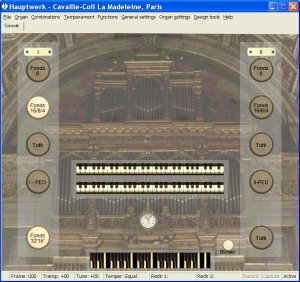 This license agreement between Pipeloops (Reiner Suikat) and the user covers the use of the free trial version of the “Virtual Cavaillé-Coll organ of the Madeleine Church, Paris” sample set for Hauptwerk (Crumhorn Labs, min. Version 2.20). Pipeloops is granting the user a persistent right to use the above mentioned sample set for the sole purpose of evaluating it. The user may install the set on as many computers as needed for the purpose. The user may give the trial version to others, but only as a complete and unaltered installation package. The sample set can only be used with a registered version of Hauptwerk (the Hauptwerk dongle is needed) due to the use of encryption. The user is not allowed to use this trial version for any commercial purpose or to publish recordings made with the trial version. All intellectual and property rights for the samples, definition files and other information and data contained in this package remain with Pipeloops (Reiner Suikat) and Peter Ewers. Any form of reverse engineering to extract samples from the package is strictly forbidden. While he equipped his first great organ (Basilique de St-Denis, III/P/69, 1841) with a “classical” concept of tone with diapasons, numerous mutations stops, cornets and mixtures in Grand-orgue/ Bombarde and Positif as well as the Ravalement of reeds of the pedal, there took place a crucial change with constructing the Madeleine organ towards the possibility of progressive and homogeneous orchestral fusion. This was provided by an increased number of stops of the same pitch (The apparant abandonment of the Äqualverbot had Cavaillé-Coll arrange for the Grand-Orgue alone two sets of 16’-stops (Montre, Viole) and the range 8’-foundation stops that should become indispensible for him also for small instruments later.) , numerous flutes, couplers of all manuals, octaves graves in Grand-Orgue and Bombardes, brilliant reeds (Trompettes 16’, 8´, 8´, 4´ in the Bombardes manual), general tutti. Originally there was not a single Cornet there! The division of organ, however, refers to the period of classical French organbuilding; the reeds that in later organs is in the Grand-orgue is in the joinable IIIrd Bombardes manual (16’, 8’, (8’), 4’); Grand-Orgue has got the 8’-reeds Trompette and Cor anglais. Cavaillé-Coll had intended unrealized Trompettes en chamade 8’ and 4’ here. Though enclosed, the Récit is - in a “pre-symphonic” manner - assigned to the IVth manual. In 1846, it covered less than 20% of all the stops (with his later organs, it would cover up to one third as a “second Grand-Orgue"). In the Positif there was in the beginning a Basson-Hautbois 8’ instead of the classical Cromorne, the Basson-Hautbois 8’ having changed places with the Musette 8’ from the Récit nowadways. The then innovative string-celeste Voix céleste II 8’ is in the Madeleine organ part of the non-enclosed Positif ever since; in 1971, Danion-Gonzalez intervened supplementarily into the general plan by establishing a Bourdon-celeste in the Récit expressif (Bourdon céleste 8’). Not until 1927, the organ was given a general overhaul by Charles MUTIN. It was impossible to ascertain whether it was on this occasion that the scope of the manual was extended from 54 to 56 notes and the scope of the pedale from 25 to 32 notes. As early as in 1956/57, the organbuilder Roethinger/ Boisseau provided the IIIrd manual with a “neo-classical” Fourniture IV as well as Cornet III, the Récit expressif with Prestant 4’ and Cymbale III, and thus extended most probably the Trompette harmonique 8’ (removed from Bombardes) by 12 base notes into a “Bombardes” 16’. In 1971, Danion-Gonzalez electrified stop- and keyaction, added - besides the before-mentioned Bourdon céleste - Flûte 4’ to the Pédale and added Larigot 1 1/3’ and Pleinjeu IV to the Récit. Grand-orgue was given the missing Cornet V. Bernard Dargassies, who is entrusted with the organ at present, gave the organ a general overhaul in 1988. Saint-Saëns lamented the low regard people had for improvization: “Sous prétexte qu’une improvisation ne sautait valoire les chefs-d’oeuvre des Sébastian Bach, des Mendelssohn, on en a détourné les jeunes organistes. (...) c’est tout simplement la négation de l’éloquence.” Ibid. “Under the pretext that an improvization of Bach’s of Mendelssohn’s masterpieces does not come close to the original, young organists were put off from improvizing at all. (...) This is simply a denial of eloquence.” Franz Liszt, to whom the well-known Third Symphony for organ and orchestra was dedicated, was often Saint-Saëns’ guest at La Madeleine. Théodore Dubois, who had asserted himself against César Franck, succeeded Saint-Saëns in 1877 and remained in office as Madeleine organist until 1896 when he became director of the Paris conservatoire. Dubois left numerous pieces for the organ that are almost exclusively of liturgical purpose. Amongst them is the popular Marche des Rois Mages and a toccata. His successor Gabriel Fauré, famous as a componist, did not leave any organ compositions. Henri Dallier was titulaire from 1905 till 1934. During Dallier's period of office, Charles-Marie Widor gave the first performance of his “Suite latine” on January 13, 1928, right at the end of the restauration of the Madeleine organ by Charles Mutin. Dallier's successor Edouard Mignan worked until 1962 when Jeanne Demessieux (student of Marcel Dupré) followed as a legendary organist who on her tournaments of the whole of Europe as well as three times the USA received triumphant glory. At La Madeleine she recorded - among other things - the complete works of César Franck on LP-disk and inspired the congregation with her Sunday morning improvizations. Dupré confessed once, that he was Jeanne Demessieux teacher as well as student. After her death in 1968, Odile Pierre succeeded her in office, who also studied with Dupré and lead an important carreer as a concert organist and teacher. She left La Madeleine in 1979. Since that year, François-Henri Houbart is the titulaire, student of Pierre Cochereau. Amongst the supplementary organists of the titulaire organists there are Charles-Marie Widor (who later became an influential organist at Saint-Sulpice), Eugène Gigout and Nadia Boulanger to be mentioned.